September is recognized as Ovarian Cancer Awareness Month, a time to raise awareness of what’s often called a silent killer among women. It’s called a silent killer because its symptoms are often mistaken for other, more benign conditions. By the time it’s diagnosed, it’s often too advanced for treatment to be effective. I was 32 and engaged to my fiancé for just a month when I was diagnosed. I found out about it through a complete fluke, too. I’ve had severe back problems since I was 18, including two major surgeries, so I thought the low back pain I was experiencing was tied to my ongoing problems. My doctor sent me for an MRI to see if my back problems were getting worse. That’s how we found the tumor. Being told I had cancer was incredibly frightening, especially since I had just started planning my wedding. My fiancé and I were discussing our future together and eventually starting a family. I had also lost my beloved grandpa to cancer 10 years earlier. Surgery revealed the cancer was caught at an early stage, giving me a good prognosis. The next five months were filled with fertility preservation so that I could try for a family someday, six rounds of chemotherapy and doctor appointments – oh, so many doctor appointments. Hair loss. Uncontrollable pain. Medications for the pain. Nausea. Medications for the nausea. Fear. Exhaustion. But I pulled through with the help of my fiancé, family, friends, co-workers and an amazing medical team. My hair grew back. The pain eased. I was able to eat the foods that nauseated me during chemotherapy. I married the man who stood by my side through cancer. And, best of all, despite losing an ovary and Fallopian tube to cancer, I was able to give birth to a happy, healthy son who’s now 2½. September 10 marked the fifth year since the surgery that saved my life. There are many women out there who aren’t nearly as lucky. Ovarian cancer is one of the most deadly cancers to affect women. American Cancer Society statistics show ovarian cancer accounts for only 2.5 percent of all female cancer cases in the U.S. but 5 percent of cancer deaths. That’s because of its low survival rate. It is the 14th most common cancer and eighth leading cause of cancer death in Louisiana women from 2010 to 2014, according to the American Cancer Society. It’s important to listen to your body and know what is normal for you. See a doctor immediately if you are experiencing unusual vaginal bleeding. If you are experiencing any of the other signs for two weeks or longer and they are not normal for you, see a doctor. 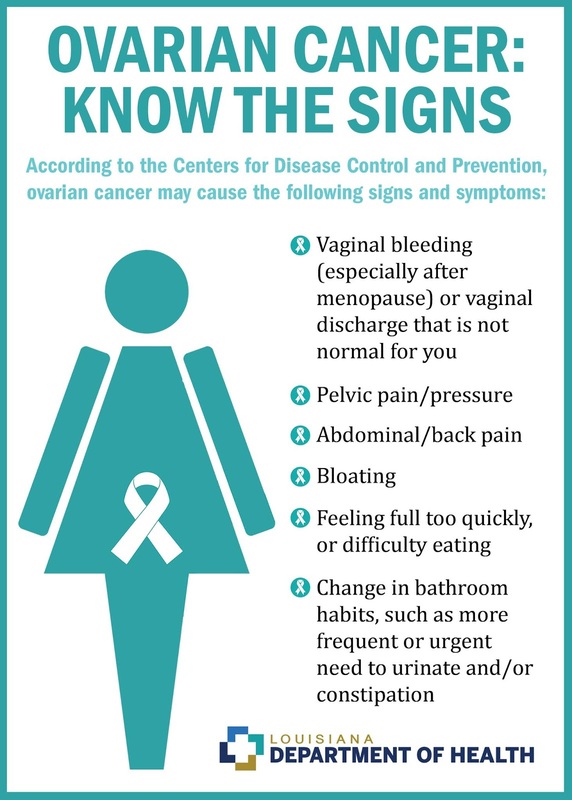 The symptoms may not mean you have ovarian cancer, but the only way to know is to consult a doctor. The Centers for Disease Control and Prevention offers this diary to track any symptoms you may notice over a two-week timespan. Some studies have suggested taking estrogen by itself (without progesterone) for 10 years or more may lead to an increased risk of ovarian cancer. Talk with your doctor about your risk factors. If you or a family member has a history of ovarian cancer, you may want to consider genetic counseling, a process that advises of the consequences and nature of a disorder, the probability of developing or transmitting it, and available options in management and family planning. These options may not be recommended for all women, so it’s best to talk with your doctor about ways to reduce your chances of ovarian cancer. 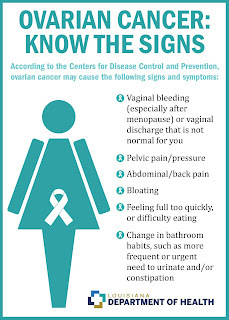 For more information, visit the CDC and American Cancer Society ovarian cancer webpages.